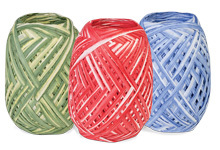 Raffia Ribbon in dozens of matte colors in 100 & 500 yard rolls. 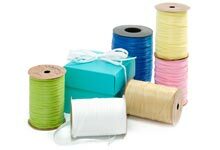 Raffia Ribbon in shiny pearlized colors in 100 & 500 yard rolls. 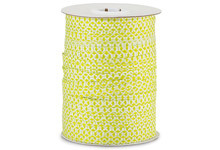 Raffia Paper Ribbon is easy to tie into fabulous bows. 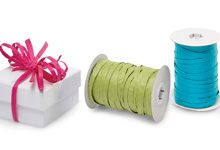 Three colors of raffia ribbon on one spool to make fabulous multi colored bows! Raffia natural ribbon made from vegetable fibers! Raffia Paper Ribbon with fun prints! Unique paper raffia with two colors on one strand! 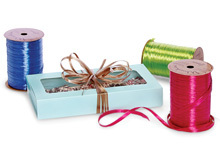 Add the finishing touch to your gift bags & boxes with raffia ribbon. 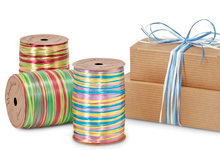 Lots of pretty colors available in both matte, shiny pealized or paper raffia ribbon in 100 & 500 yard rolls. This ribbon is also known as Wraphia. 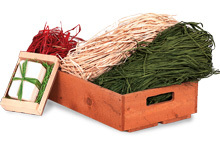 Try Natural Raffia when you want the look of raffia grass.